My mission is promoting the status of women by empowering them trough education, working opportunities and building networks, so each woman is becoming an agent of change in her community. 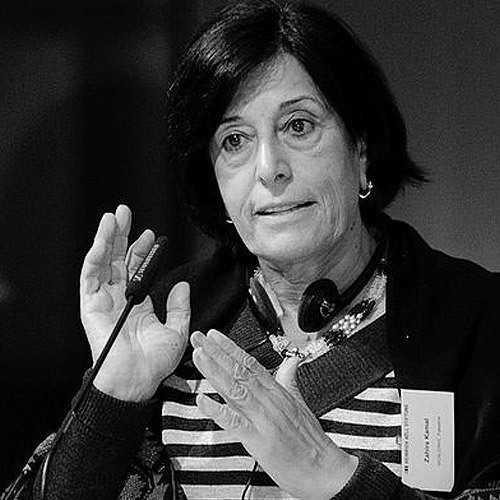 Zahira Kamal was elected in March 2011 as the General Secretary of the Palestinian Democratic Union party (FIDA). During the period April 2006-May 2012 she was the Director of Palestinian women Research and Documentation Center (UNESCO project). She was appointed as the first Minister of Women’s Affairs in November 2003. She continued to be as a Minister of Women’s Affairs up to April 2006. During the period 1996-2003, Ms. Kamal was the General Director of the Gender Planning and Development Directorate at the Ministry of Planning and International Cooperation. She worked at UNDP from 1993 to 1995 as Director of the Women in Development Program. She has been and still politically and social and women activist, she was a member of the advisory committee to the Palestinian negotiation team for peace negotiation. She has been founding member of several women NGOs; Women centre for Legal Aid and counseling, Women Studies Centre, Women Affairs Technical Committee, Business Women Association, Jerusalem Link, the International Women Commission for Just Peace between Palestinians and Israelis. Currently she is the chair person Women Center for legal Aid and Counseling, Women Studies Center, and a board member of Foundation for Future. She was rewarded with an honor citizenship by the city of Bologna –Italy and Los Anglos in USA, and the prize of freedom and human rights in Bern-Switzerland. In 2013 se was selected as consultant for Women development in Lybia and in developing a gender mainstreaming strategy for women in Lybia. Ms. Kamal has written a number of articles and studies on Palestinian women, women’s empowerment, peace and the Israeli-Palestinian conflict, women and citizenship, enhancing the role of women machineries. I am now the general secretary of the Palestinian Democratic Union party (FIDA party), and trying my best through my position is to promote the status of women and youth by opening for them opportunities for leadership positions (the party ad a quota 40% for women and 50% for youth). We were busy in a campaign for raising the minimum wages, and another campaign for declaring a social security law, and participating in the 16 days world campaign for combating violence against women. As part of the Palestinian leadership I am participating in the political meetings taking place. With Dr. Neomi Chazan former Keneset member they got the prize of freedom and human rights in Bern-Switzerland. Zahira was appointed as a jury member for best project award on women development in Palestinem, Jordan and Libanon. The award will be given by UN Women and GIZ.